The Big Bang theory describing the origin and expansion of the universe from a very tiny and energetic initial state was developed initially in the 1920s as a solution for Einstein’s equations of general relativity. It assumed, correctly, a uniform (homogeneous) density of matter and energy. While the universe around us today appears highly non-uniform, with visible matter apparently concentrated in groups of galaxies, and in individual galaxies, gaseous nebulae, and star clusters, stars, and planets, all the evidence indicates that matter was very uniformly distributed throughout the first one million years of existence. At that time there were no stars or galaxies, rather the universe consisted of hot dense, but expanding, gas and photons (light). Even today, on the largest scales of 500 million light years and beyond, the universe appears to be quite uniform on average. The first great support for the Big Bang came from the detection of what we call the Hubble expansion, named for Edwin Hubble, who in 1929 first demonstrated that galaxy recession predominates and depends on distance from us. Galaxies on average are all moving away from each other, unless they are gravitationally bound to their neighbors. The rate of expansion is simply proportional to the distance to the galaxy; this is known as Hubble’s law. Every galaxy moves away from every other galaxy regardless of its position in the universe; this implies a global and uniform expansion. How do we determine this relationship? The light from these distant galaxies is shifted to be redder than normal in proportion to the velocity away from our galaxy. The redshift is a measure of the velocity of recession and the velocity is found to be proportional to the distance from our Milky Way to the galaxy in question. To be clear, the galaxy velocity and distance follow a linear relation. If we were located in another galaxy, we would observe the same effect. Most of the galaxies would be receding from us as well, at rates proportional to their distance. This is just what one expects for a universe which is isotropic – the same in each direction – and which is expanding uniformly. Each dimension of three-dimensional space is getting larger with time. The gravitationally bound objects, such as the galaxies themselves, are not expanding, but the space between the galaxies is stretching and has been since the Big Bang initial event. Since the rate of the expansion is proportional to distance, one can take the proportionality constant, known as Hubble’s constant, and by inverting that determine an approximate age of the universe. It amounts to ‘running the movie backward.’ The age works out to 14 billion years, which is very close to the current best estimate of the age of 13.8 billion years, about 3 times the age of the Sun and the Earth. Another great success of the Big Bang model was in its prediction of the helium abundance. The same hydrogen fusion process that powers the Sun took place in the early universe during the first 20 minutes, when the temperature was millions of degrees. In the Sun hydrogen is fused to created helium. For the early universe, this is known as primordial or Big Bang nucleosynthesis. There was only time enough and the right conditions to create helium, the second lightest element in the periodic table, and also the heavy form of hydrogen known as deuterium, plus just a bit of the third element lithium. None of the heavier elements such as carbon, nitrogen, oxygen, silicon or iron were created – this would happen later inside stellar furnaces. The final result of this cosmological nucleosynthesis turned 25% of the initial available mass of hydrogen into helium, and into trace amounts of deuterium, lithium and beryllium. The primordial abundance observed in the oldest stars for helium and deuterium matches the predictions of the Big Bang nucleosynthesis model. The Big Bang moved from being possible theory to well-established factual model describing the universe when the first detection of the cosmic microwave background was published in 1965 by Arno Penzias and Robert Wilson, who received the Nobel Physics prize for their discovery. 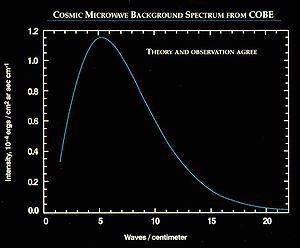 The cosmic microwave background is blackbody thermal radiation at millimeter wavelengths in the radio portion of the electromagnetic spectrum., and as we observe it at present, it has a temperature of a little under 3 degrees above absolute zero (see image above which has the characteristic thermal blackbody shape). It fills space in every direction in which one observes, and is remarkably uniform in intensity. The cosmic microwave background dates from a time when the universe was about 380,000 years old, and the radiation was originally emitted at a temperature of around 3000 degrees on the Kelvin scale. It also has redshifted, by over 1000 times. Thus we detect today as radio waves photons that were originally emitted in the optical and infrared portions of the electromagnetic spectrum when the universe was only 380,000 years old. Unlike the hydrogen and helium atoms which are found in stars and on planets, these photons have stretched out in proportion to the expansion of the universe.